Two weeks on from the Brexit vote, we’ve had the chance to reflect and contemplate the potential impact of the momentous decision to leave the European Union. Now is not the time to stand still and wait; now is the time to act, and that is how we are approaching this in our company. It wasn’t the result ManpowerGroup nor the majority of global companies had hoped for — it was an unwelcome surprise for many. As a business, however, we are prepared. When the status quo unexpectedly alters, we move to Plan B. While the UK Parliament works out what’s next and who governs the country towards it, there are many companies in need of solutions, and many job-seekers wanting clear advice and fresh opportunities. This environment of certain uncertainty is nothing new. We are used to a post-recession landscape that is less stable and harder to predict. In today’s world of work, companies plan for unpredictability and need to be built for change. Business leaders must now look ahead and lead, and in doing so ensure the UK maintains its enviable competitive advantage, from which it has long prospered. It will be some time before a new UK Government is in place and determines when and how it will invoke Article 50. It will take two to three years for negotiating priorities to unfold. The concrete implications of the vote and the political road ahead are unclear, but business leaders need not be. The knee jerk reaction to uncertainty is often adopting a wait and see posture or worse, panic. Fears of the European Union unraveling in a rapid sequence domino effect across the region post-Brexit are premature. Knock-on trembles may be felt elsewhere in Austria or the Netherlands, but in contrast to this unsettling scenario, this decision may serve as a welcome wake-up call to others outside the UK, and accelerate much-needed reforms within the European Union. This is a political issue first and a financial market issue second — the impact on the real economy is harder to gauge. 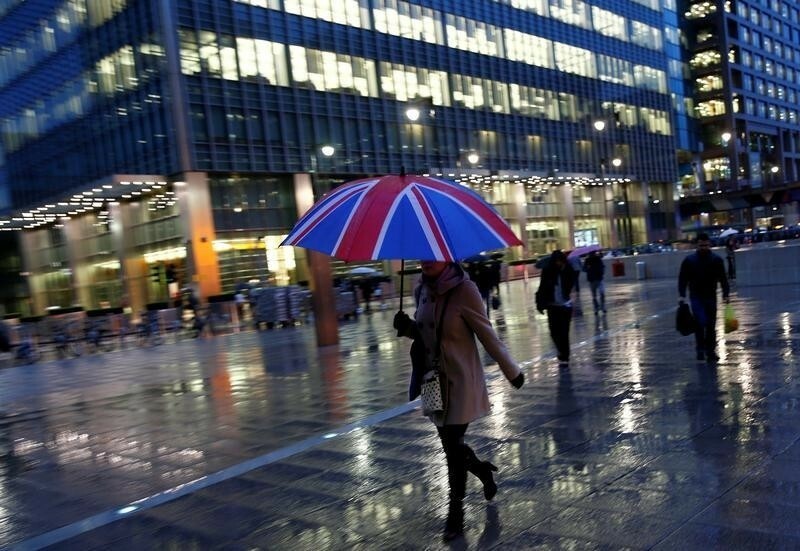 The UK is likely to see a slowdown but the impact beyond its borders is less predictable. The right reaction for businesses is to keep calm and carry on — it’s business as usual, until proven otherwise. The UK labor market and economy have been performing well so far in 2016. This referendum result comes at a time when the UK has the best employment numbers it has seen in years. Unemployment is close to 5% and workforce participation is at a high of 74%, almost 10% better than in the US. On paper, the UK economy is one of the healthiest in Europe, even the world — which, of course, suggests Brexit was about more than just the economy. I’ll come back to that. For now, businesses should capitalize on the country’s economic and labour market health. What we know for sure is that nimbleness and being ready to adapt to changing circumstances will be critical during this time. With the eyes of the world on the UK and Europe, employers must play a role in protecting Brand UK. The Brexit vote suggests that the UK is not the attractive and welcoming destination for skilled talent that it has been for decades, which is far from the reality. The mobility of talent has been key to helping businesses fill vacancies, particularly in shortage sectors including construction and healthcare — in the UK, one in ten doctors are EU immigrants, as are 10% of workers in manufacturing and 14% in food services and accommodation. This free flow of labour is one of the fundamental tenets of the EU and employers relying on talent as a key economic differentiator must ensure this is maintained for those in the UK today, and for those wishing to be there in the future. Employers are well-placed to address this and must influence the UK Government to retain the competitive advantage that means businesses can source talent beyond borders. 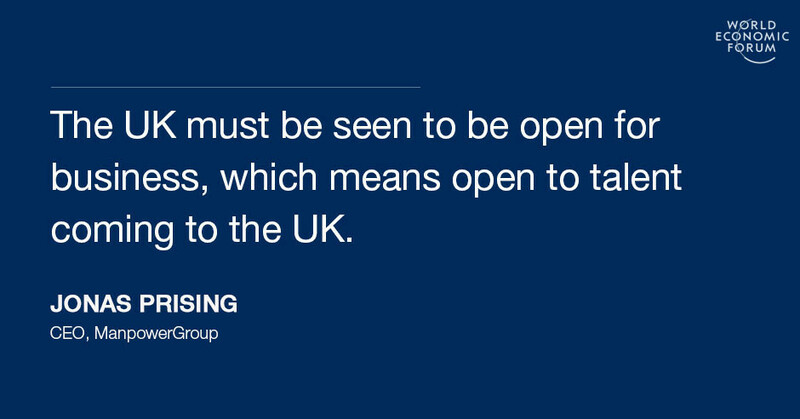 The UK must be seen to be open for business, which means open to talent coming to the UK. Many say this was a vote won on emotions not facts. If we learn one thing only from Brexit, it’s that beyond our organizations, in the communities in which we operate, people feel disenfranchised and disconnected. The much-talked about polarization of the population has just played out in front of our eyes. Most developed economies have seen stagnant wages for more than a decade, but averages can be misleading. The Haves, with in-demand skills in IT or engineering for example, have continued to see wages increase even during the recession. The Have Nots, with low or outdated skills, have seen wages stand still or decline. 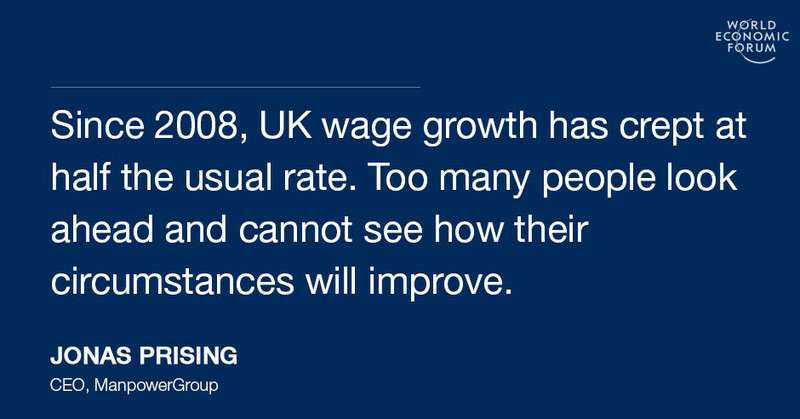 Since 2008, UK wage growth has crept at half the usual rate and productivity almost stalled. Too many people look ahead and cannot see how their circumstances will improve. This is not unique to the UK so is a warning for countries and leaders beyond the UK. It is the result of post-recession structural change, where forces such as technological change, globalization, demographic changes and supply chain sophistication start to impact labor markets globally, with unsettling consequences for many. As businesses we have a responsibility to ensure we are a positive contributor to societal change. Employers need to ask — what can we do to build employability in the community in which we operate? How can we invest in local talent pools and provide learning opportunities that build talent pipelines? Investing in people and upskilling programs aligned to business needs will drive sustainability and employability for the long term. It’s not a nice to have, it’s business critical. It’s also an opportunity to take social responsibility and be part of the solution. As Chairman and CEO of the world’s leading workforce solutions company, people are my priority and they should be for all employers right now. The UK is on the cusp of being treated much the same way as most other countries where immigration is limited, rather than being perceived as the place where access to talent is easier. In that sense, the UK will not be not worse off than many other countries, but risks giving up the truly distinctive competitive advantage of having access to a skilled workforce, which is crucial for national prosperity and companies alike. The UK must retain this competitive advantage. Business leaders should make clear that EU talent is valued and essential in their organizations and that they won’t stop welcoming the people they need to remain competitive. Tell your own people first to make sure the message is loud and clear. The process to exit the EU will take time and change will be very gradual — until it is not. It is of course easier to adapt if you are smaller and agile. And for now, the UK labor market remains one of the strongest in Europe. So while the Government must urgently figure out the course it will steer, business leaders cannot afford to wait. Employers should show the world and their employees that the UK is very much open for business and continues to welcome and value international talent. That’s exactly what our organization is doing and we’re proud to work with many others who share this focus.